Everywhere you go, there is some regional specialty for which the area is known, and more often than not, it’s something that just might kill you if consumed in large quantities. I kind of love that. So, I have decided that part of my trip will be to sample the rich, decadent, completely deadly regional dishes I come across. If you have suggestions for future fatty food adventures, feel free to e-mail me at stinawork@gmail.com. Attempt #1: This dish, using glorified potato chips, a scant sprinkle of gravy and completely melted cheese, was only masquerading as poutine. But I had to start somewhere. The gist of it: French fries, cheese curds and gravy. This is no novelty food in Québec, though it sounds like it must be. From what I can tell, it’s still a vital dish, one that I saw offered in various types of eateries across the province. Though there are variations on poutine, common Québecker wisdom states that any poutine worth its salt will contain cheese curds that squeak. 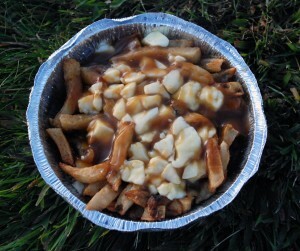 Why I care: Poutine is proof that Americans aren’t the only ones who love meals with a heart-stopping amount of fat. My journey: I cannot remember when I first heard of this caloric avalanche. I only know that from the moment I entered Canada, I wanted it. It’s strange to hanker for something you’ve never had, but the drama of this dish drew me in. Just thinking about the sum of all those rich ingredients made me feel like a rebel. Unfortunately, my first poutine was the definition of disappointment, something Tim Gunn might have called “a hot mess” if it weren’t lukewarm. My friend, Tory, and I each got one at a nice little Irish pub in downtown Toronto. We had both been pumped for the experience, but when our plates arrived, the letdown was instant and obvious. 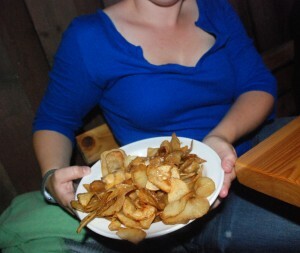 Instead of fries were potato chips (they tasted homemade, but still). In place of chewy, intact curds were little pools of melted, bland cheese. The brown sauce sparsely topping all this tasted fine but by no means saved the thing. The experience left me a bit sad, and by the bottom of the dish, I was reaching for ketchup. Attempt #2: See how the cheese curds are completely intact, without a hint of meltiness? Not good. My next chance for poutine was in Wakefield, a little, English-speaking Québec town, about half an hour outside of Ottawa. This time, the dish wasn’t so massively off-the-mark as it was simply mediocre. I wanted to like it, as it was made at the coolest roadside stand — a bright blue school bus, which had been anchored in place. The biggest problem was temperature. The fries were good, but the sauce was tepid, and the cheese curds were downright cold. The effect wasn’t a bit enticing, and I couldn’t finish it, even though I got “un petit.” When my Wakefield host, Diana, saw the sad, rich mixture, I think her resolve to not eat poutine was strengthened. She had already lived in Canada for eight years and had never touched the stuff. Reflecting upon my recent experiences with it, I didn’t blame her. With that, my zest for poutine was broken. Usually, I do persevere more with something, but I was dealing with a meal that health-conscious Québeckers consider a one-a-year thing, and I had already had it twice in a few weeks. Like most people might, I decided to move forward with my life in other, less greasy ways. And, for the most part, it worked. For several weeks, poutine and I were strangers again. Still, there was something about the food that was always bothering me. It was a bit of unfinished business, and I never do well leaving that alone. 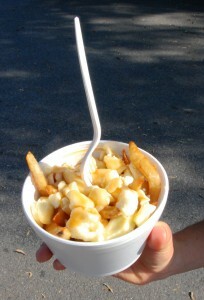 When the day came to leave Québec, my poutine problem was still quietly nibbling away at my heart. As I was driving south toward America (specifically the crunchy, non-poutine-loving state of Vermont), I was suddenly grabbed by the understanding that I had to give this thing one more shot. A tiny voice, perhaps coming from the poutine of my near future, was telling me not to give up. When I pulled off the highway, I had no idea where I was, just that I was somewhere in the province’s sparsely populated woods. I’m sure a charming old town lay somewhere close by, but I was in an intensely impersonal strip mall right off the road. Near me was a chinese fast food/burger joint with harsh flourscent lighting and a single woman working behind the counter. I knew it was a long shot, but that usually doesn’t stop me from anything. When it was my turn, I ordered my obsession for about $5. I couldn’t imagine it was worth it. But when the lady was done shoveling, ladling, and sprinkling all the ingredients into a tinfoil to-go pan, I could feel something was up. This had taken too long and there had been too much care put into it for it to be awful. When she handed me the maleable, metal container, it was piping hot, so much so that I had to take it outside and drop it gently on the strip of grass near the store. When I peeled off the cardboard cover, I was greeted with a beautiful sight. The fries were chubby and soft. The shiny gravy was steaming. The cheese curds were holding their shape but melting quickly. Every time I removed a fry, the toasty muck of cheese and gravy would slowly glom together again and cover the hole. Attempt #3: Finally, success. Gravy-infused success. Best of all, I was into the taste. The gravy was light but pleasant, like the reliable brown stuff you might find at any American diner or KFC. The fries were tender and fatty as can be. When I bit into the cheese, it squeaked. I couldn’t take this slowly; I was too filled with desire. Though the meal must have weighed close to a pound, almost all of it was gone within a few minutes. Here I was, with only an hour or so left in the country and I felt that, finally, I was in the presence of poutine greatness. Mon Dieu. 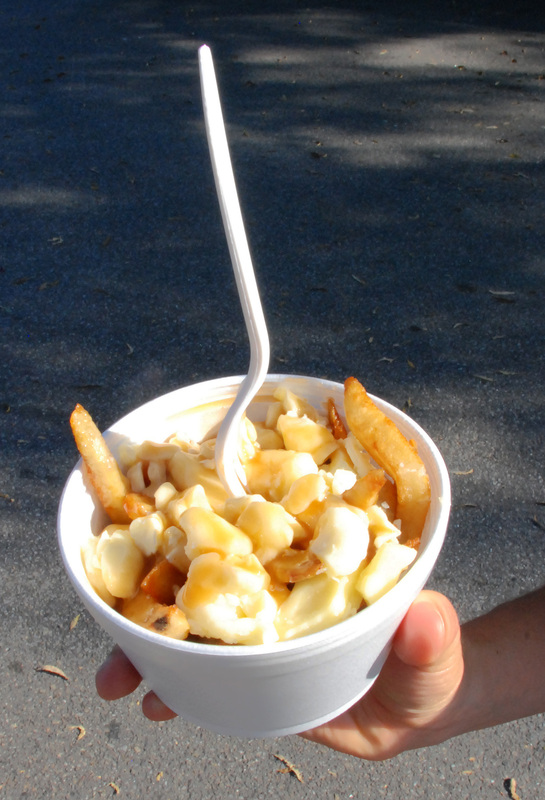 It’s several months later now, but every time I think back on poutine, I smile. And that’s no sentimental overstatement. Poutine’s improbability and lack of coolness makes me love it. In no time flat, it has become one of my favorite travel anecdotes, especially good for shocking people from California and Colorado. But I always feel a little guilty when I treat it like a joke. I feel as though I owe it more than that. I’d rather treat it like what it really is — perhaps the most decadent comfort food I’ve ever come across. When done right, of course.